Disabled Star Pride off Cuttyhunk Friday. Footage from Air Station Cape Cod's HC-144 Ocean Sentry. A cruise ship that became disabled off Cuttyhunk Friday afternoon was safely escorted by tug to Newport where she will undergo inspection before continuing on her voyage, the Coast Guard said. Coast Guard crews and the Buzzards Bay Task Force responded to the scene about two miles off Cuttyhunk in Buzzards Bay at about 3:20 p.m. Friday after the captain of the Star Pride had called to report the ship lost power. 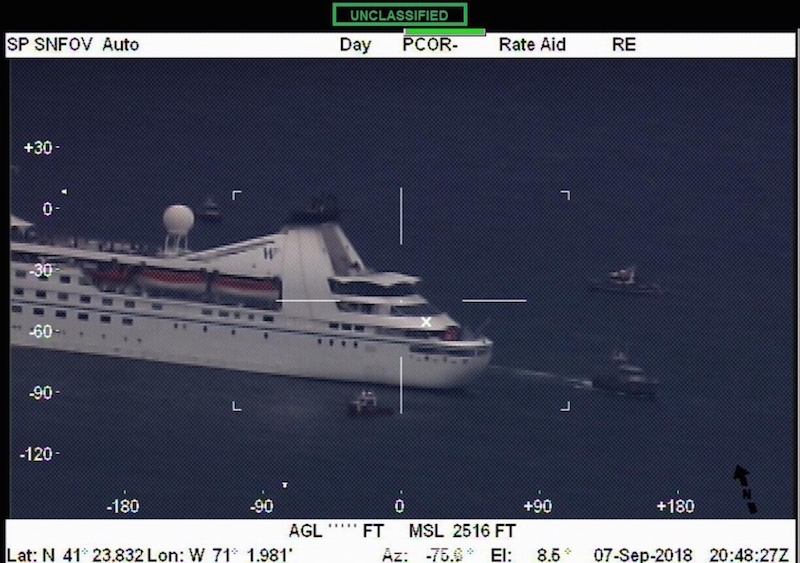 The 376-foot ship had 191 passengers and 160 crew on board and was en route to Manhattan. Failed cooling systems caused engines to shut down. The ship was able to safely anchor outside the channel and power was restored at about 5 p.m, the Coast Guard said. There were no injuries and no damage to the ship, which is owned by Windstar Cruises of Seattle. Stations Cape Cod Canal, Woods Hole, Menemsha and the Buzzards Bay Task Force all responded, and a helicopter from Air Station Cape Cod was also on the scene, the Coast Guard said. The Star Pride was on a 17-day cruise from Iceland to New York, according to the Boston Globe.